My oh my, Southern-Style Easy Fresh Peach Pie! 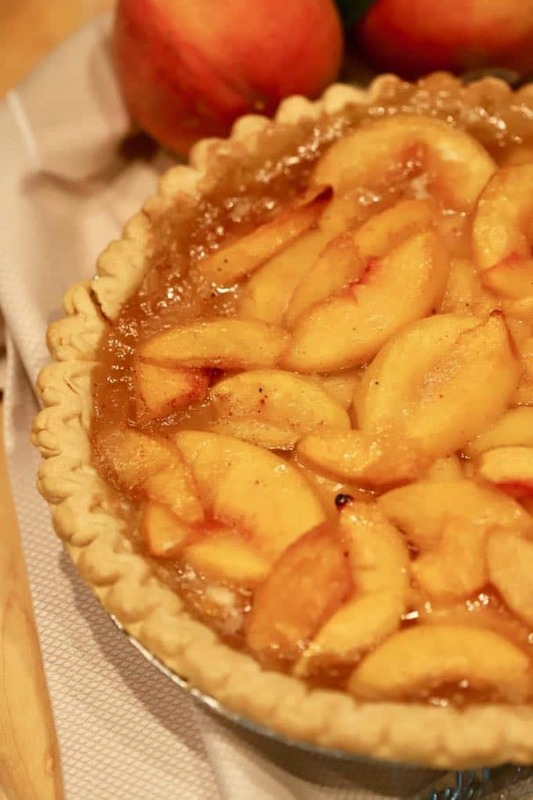 Full of sun-ripened fresh peaches cooked to perfection in their fragrant juices; this easy fresh peach pie recipe is one you will want to make time and time again. Peach season is in full swing and grocery stores and farmers’ market bins are full of the dusty rose-colored, velvet-like fruit, where the air is perfumed with the sweet aroma of ripe peaches. Both Georgia and South Carolina boast of their peaches being the best of the best, but for me, a basket of fresh juicy peaches from either state makes me almost giddy. The only question is what to make with this luscious and nutritious fruit? 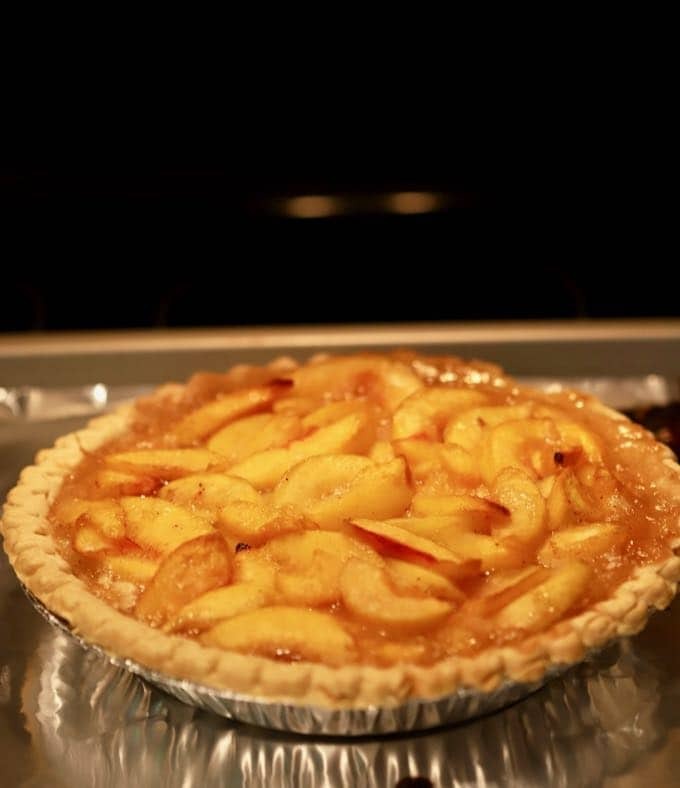 Today, my Southern-Style Easy Fresh Peach Pie won the toss and is in the oven right now filling our home with the most intoxicating aroma of peaches, nutmeg, and cinnamon bubbling away in a flaky crust. 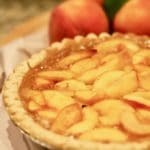 I think this is the best peach pie recipe for several reasons, the most obvious being the taste, and boy oh boy, does this juicy peach pie score a ten in that department. 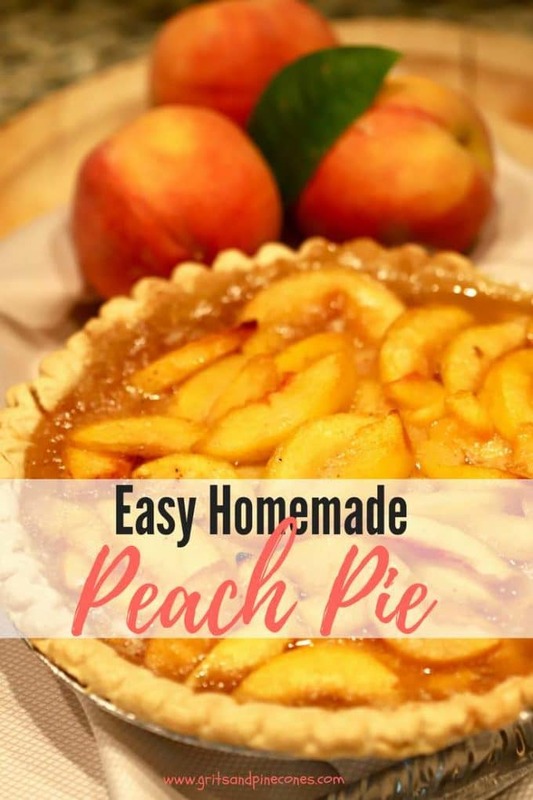 This one-crust peach pie recipe is also very versatile and I have also included instructions for making a peach pie with frozen peaches as well as a peach pie with canned peaches. No matter what time of the year it is, you can have this Southern-Style Fresh Peach Pie for dessert! You have a basket of peaches from the farmers’ market, but aren’t ready to prepare them yet; now what? 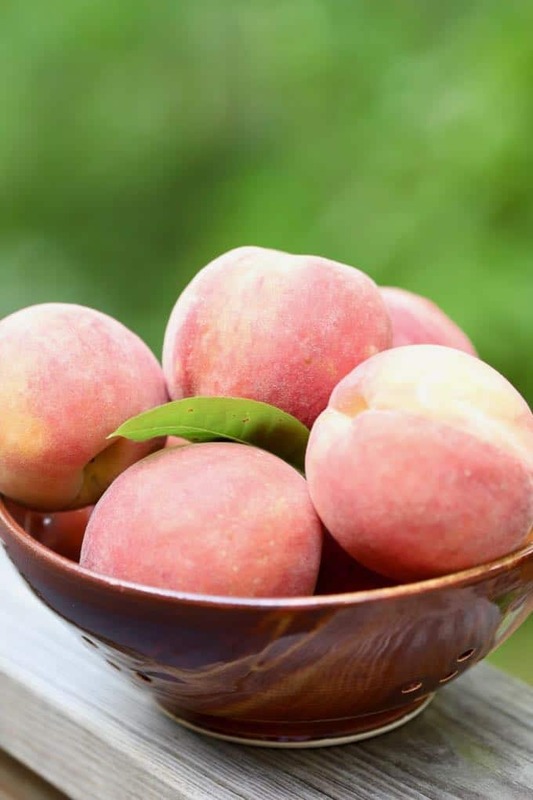 According to the folks over at The Kitchen, you can store your unripe or partially ripe peaches on your kitchen counter for a few days at room temperature. Don’t wash them, and place them in a single layer, stem-side down. If they are very ripe, you can store them in the refrigerator in your fruit and vegetable drawer at the highest humidity but you must use them within a day or so. As you probably know peaches are very perishable and must be used within a few days of purchase. 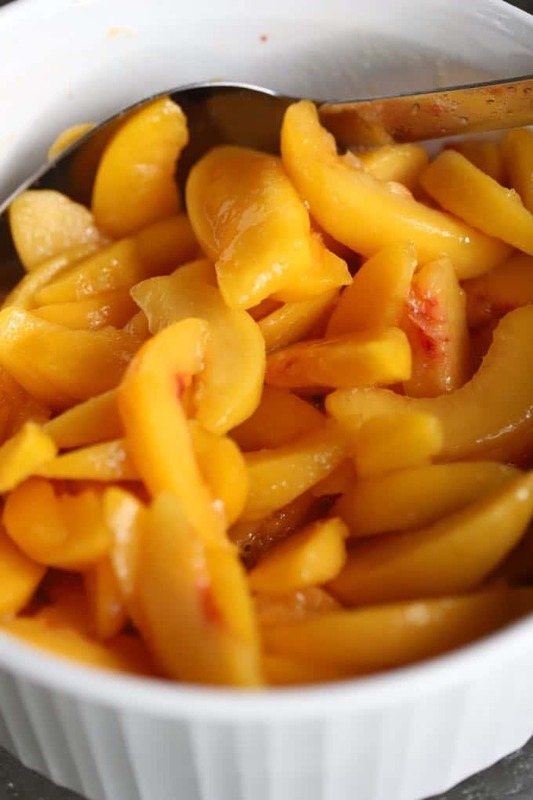 If you have more than you need, the simplest way to store peaches is to freeze them. Just peel and slice your peaches, place the slices on a baking sheet and freeze for an hour or so. Then remove the slices, place in a plastic freezer storage bag, remove as much air as possible, and store in the freezer for a month or so. Since peaches are in season right now, it’s no wonder that my peach recipes are among the most popular on my blog. 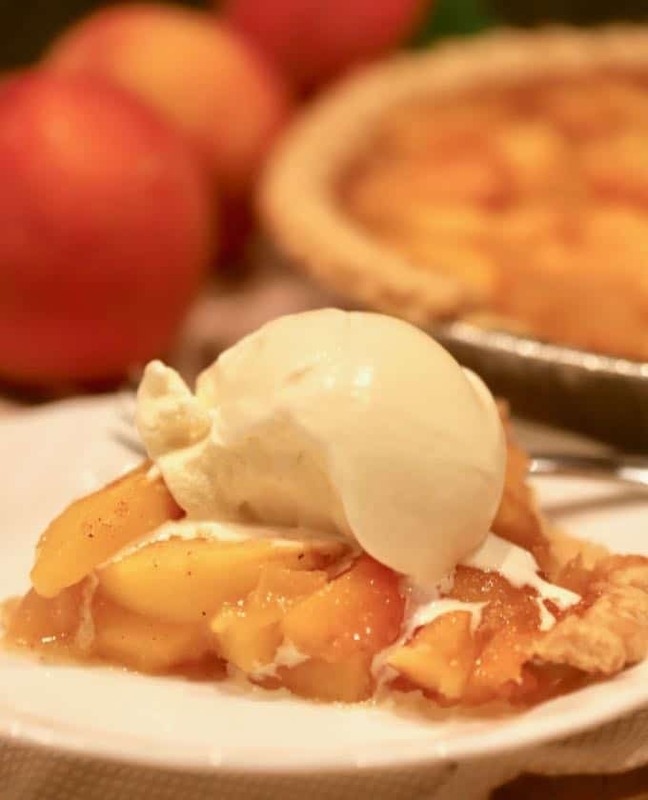 And, if you like peaches like we do, besides this delicious peach pie, you might also want to try my Easy Southern Peach Bread, Homemade Fresh Peach Ice Cream, Peaches and Cream Pie, and Peach and Blackberry Crumble. If you are looking for savory recipes using peaches, check out my Easy Southern Peach Salsa, Grilled Chicken with Peach Glaze, and Grilled Pork Tenderloin with Peach Glaze and Peach Salsa. 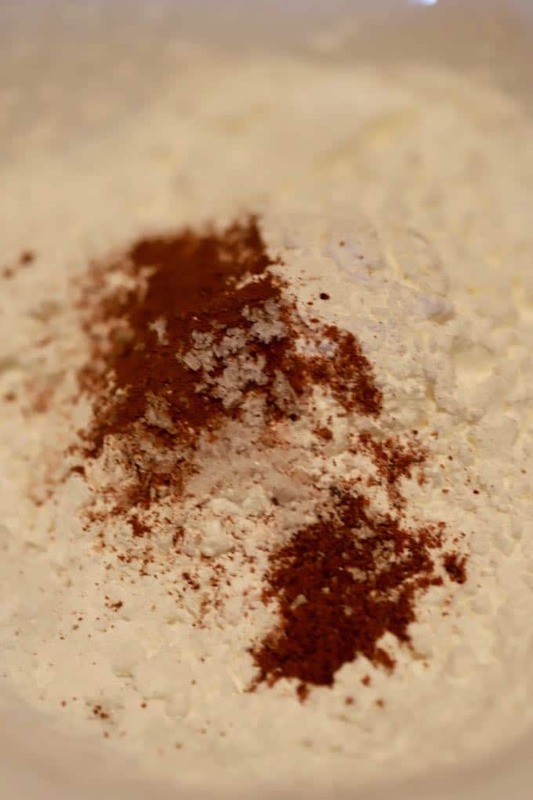 In a small bowl, mix together the sugars, cornstarch, nutmeg, cinnamon, and salt. Peel the peaches, remove the pit and slice thinly. Add the peach slices to a large bowl. Sprinkle the cornstarch-sugar mixture evenly over the peaches, a tablespoon at a time and mix thoroughly before adding additional cornstarch-sugar. Adding it gradually ensures it won’t clump and will be evenly distributed. When all of the cornstarch-sugar mixture has been added, add the lemon juice and mix to combine. 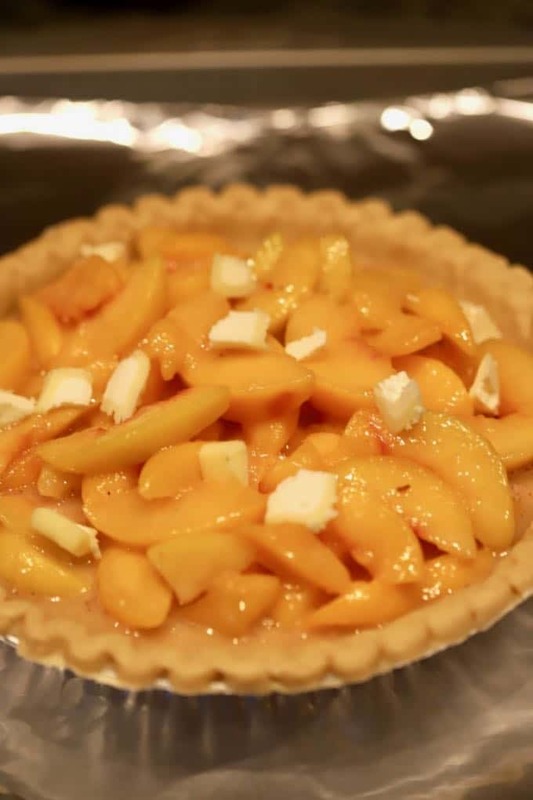 Spoon the peaches into the prepared pie shell and spread out evenly. Dot the top of the pie with small pats of butter. Place the unbaked pie on a baking sheet covered in foil or parchment paper and place in the oven. Bake the pie for 15 minutes, then reduce the oven temperature to 350 degrees. Bake at 350 degrees for 30 minutes. Remove the pie from the oven and cover the crust with strips of aluminum foil to keep it from burning. Return the pie to the oven and bake for an additional 30 minutes to allow the filling to become bubbly and thick. Remove the pie from the oven and allow it to cool completely before cutting. Southern-Style Fresh Peach Pie is delicious served with a scoop of vanilla ice cream. To make a peach pie with frozen peaches, simply substitute 6 cups or 2 pounds of frozen peach slices for the fresh peaches. To make a peach pie with canned peaches, simply substitute 6 cups of canned peaches which have been drained. If you don’t have cornstarch, you can substitute 3/4 cup of all-purpose flour. The peach pie filling will continue to thicken as it cools, so be sure to let it cool completely or let it sit overnight before cutting. And finally, to be the first to receive notifications of my new recipes by email enter your email address here or in the Subscribe Box. Southern-Style Easy Fresh Peach Pie is full of sun-ripened peach filling cooked to perfection. 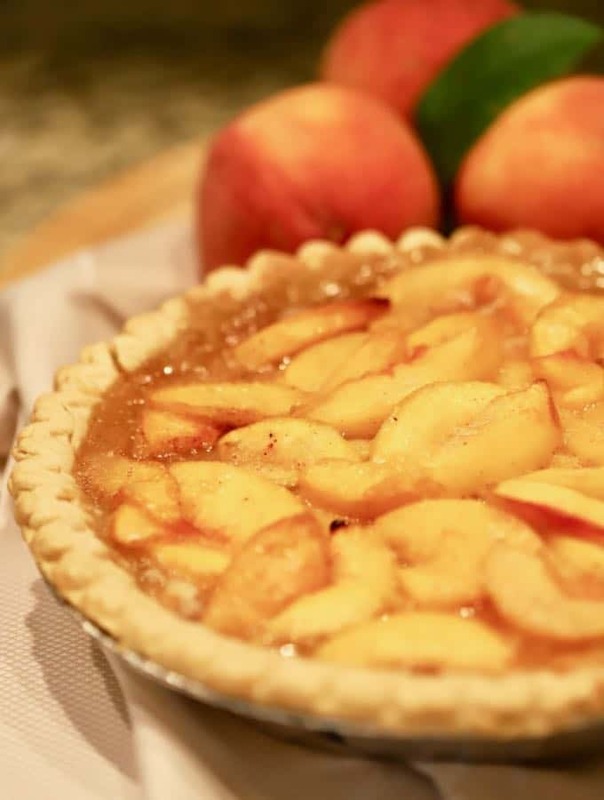 This peach pie recipe is one you will want to make time and time again. Sprinkle the cornstarch-sugar mixture evenly over the peaches, a tablespoon at a time and mix thoroughly before adding additional cornstarch-sugar. Adding it gradually ensures it won't clump and not be evenly distributed. Bake the pie for 15 minutes, and reduce the oven temperature to 350 degrees. Bake at 350 degrees for 30 minutes. 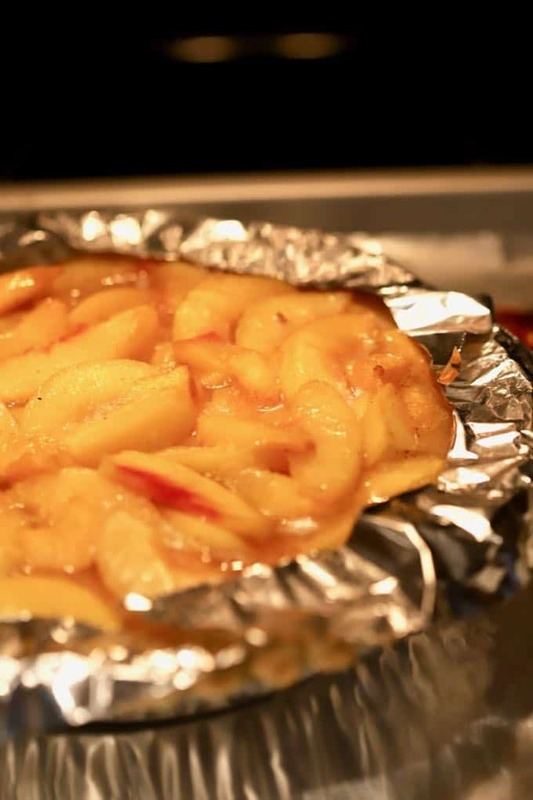 Remove the pie from the oven and cover the crust with strips of aluminum foil to keep it from burning. If you don't have cornstarch, you can substitute 3/4 cup of all-purpose flour. Sharon, You have the best Southern recipes ever. And this peach pie looks fabulous. Thanks for posting. This pie has great flavor, maybe the best peach pie ever. I used my trusted crust recipe. Definitely cover the crust to keep from over browning. However, it needed to cook a lot longer to get the cornstarch to set. I tested my oven temp to make sure it wasn’t an oven issue. Not sure if anyone else has experienced this issue. Great recipe though. Will make it again. So glad you enjoyed the pie! The filling will still be a little loose when you take it out of the oven, but as it cools it will firm up.